I started my card by stamping my chosen sentiment directly onto my card base. As it is quite a long sentiment I took a moment to make sure it was completely straight before stamping it with the aid of my MISTI. I used my go to black ink, which is MFT Black Licorice Hybrid ink. Next I started working on my background. I knew I wanted to make a layered splatter background. First I added large splatters using the Art Splatters stencil from STAMPlorations. I ink blended three large splats, positioning them such that the line of splatters moved across the card from top left to bottom right. I used Delicata Pink Shimmer pigment ink for the ink blending, which gave a soft, shimmery coverage. Before proceeding to the next step I dried the pigment ink with my heat tool and then treated the card base with my anti-static powder tool. I then added my second layer of splatter, which I stamped and heat embossed. 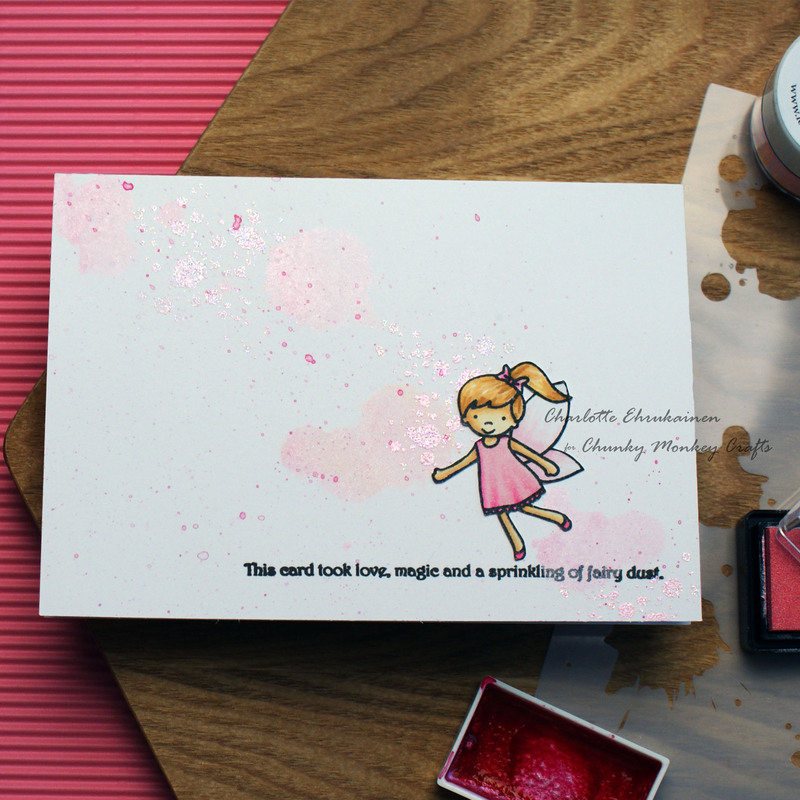 The stamp I used was the Mini Ink Splatter stamp from Your Next Stamp, and I heat embossed with Tutu Pink embossing powder from Love From Lizi. This embossing powder has glitter through it, which added to the shine on the card. Despite the drying and anti-static powder some of the embossing powder did stick to the pigment ink, but I was able to use a dry paintbrush to tidy it up. The final layer of splatter that I added was with watercolour paint. I used the Pink Pearl paint from the Pearl Colours set by Gansai Tambi. 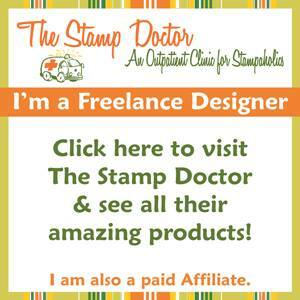 I splattered it across my card base again following the diagonal line I’d created. At this stage I realised I needed something more than just a background and sentiment. I decided to add a fairy from Avery Elle’s Pixie Dust. I stamped it with MFT Black Licorice Hybrid ink onto a snippet of alcohol marker friendly paper, then coloured it with my Spectrum Noir Illustrator markers. I kept with the pink shades I had used for my card, giving her a pink dress, bow and shoes, as well as pale pink wings. I even toyed with the idea of pink hair but in the end I decided to stick with more natural colours for her hair and skin. Once I’d finished colouring I fussy cut the image and adhered it into place on my card base, which completed my card. I’m so pleased with how this card ended up. 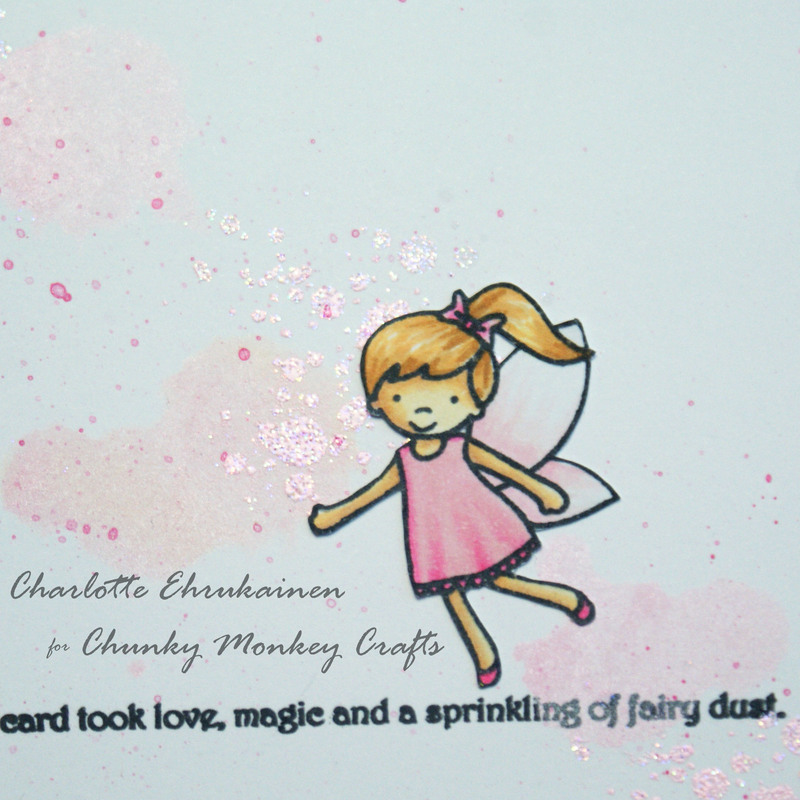 Adding the fairy to the card was definitely the right decision to finish it off. The background turned out just as I hoped too, though in the photo it’s hard to pick up all the detail and the pretty shimmer and sparkle. It’s much clearer in real life! Don’t forget that Chunky Monkey Crafts is closing down once all the stock is cleared, so if you’ve been enjoying the projects I’ve made with this stamp set and would like one for your own, be sure to grab it soon before they’re all gone! Use the discount code below to save on your order. Use code charlottecmc10 to save 10% on your order at Chunky Monkey Crafts. Available whilst stocks last. This card is simply magical! Thanks for playing along with us this month at The Rainbow Card Challenge! Just love this love the background Thank you for sharing in our challenge at Classic Design Team Challenge we really appreciate you joining in. Oh absolutely delightful! Loving all the pink and sparkle Charlotte. Thanks so much for playing at AAA Cards, hope to see you joining in with future challenges too. A darling card and she would have looked cute with pink hair too! I love the shimmer! Thanks for playing along with us at Watercooler Wednesday. What a great CAS card! Such a fun design. Thanks for sharing it with us at Digi Choosday good luck and hope to see you again! What a sweet card! Love all that shimmer! Thanks for playing along with us at AAA Cards!